Our program is comprised of passionate students committed to improving lives abroad through creative and sustainable engineering solutions. The Columbia University chapter of Engineers Without Borders aims to address the problems facing people both locally and overseas by leveraging the skills, talents, and passions of Columbia University students and the sponsorships formed with our organization. Our members are pursuing many different engineering degrees, but all share the desire to do meaningful work and make a difference. The chapter currently consists of three programs in Ghana, Uganda, and Morocco. The Ghana program, which started in 2004, successfully built a water distribution system and latrines in the farming community of Obadan. It’s now in the process of implementing a similar water distribution system in the nearby village of Amanfrom. Each program draws from the skills of its members to provide technical solutions to worldwide problems. Amanfrom is a rural village of 2000 subsistence farmers in the eastern region of Ghana. 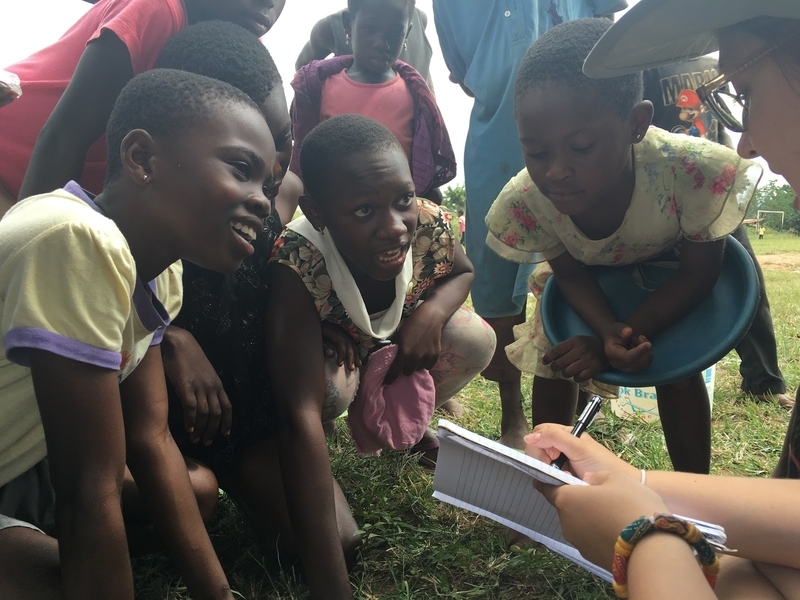 When we began working with them in 2015, they lacked clean year-round water sources. We have since collaborated with the community to substantially increase clean and safe water supply to the region by constructing wells in key locations. Our goal is to assist the community in becoming self-sufficient through the development of a sustainable water distribution system. This upcoming summer, we will be constructing 2 new wells with standpipes to increase the water supply in the northern part of Amanfrom. In 2014, the village of Amanfrom contacted us asking for a water distribution system similar to our past project in Obodan. Amanfrom relied exclusively on seasonal surface water and shallow groundwater from streams, springs and hand-dug wells, all of which failed to meet WHO standards. To address this issue, we drilled and constructed two new wells within the community during our first implementation trip in August 2016. These two new reliable sources of water have greatly increased the water capacity of the community. The local government has begun collecting small fees for water, which enables them to save funds for maintenance, repairs and future development projects. In the winter of 2017, three of our members, accompanied by a mentor, travelled to Amanfrom to assess alternatives for increasing the water supply to the community, as the yield is currently insufficient, and as both wells are located in the southern region, those living in the north continue to rely on contaminated water sources. 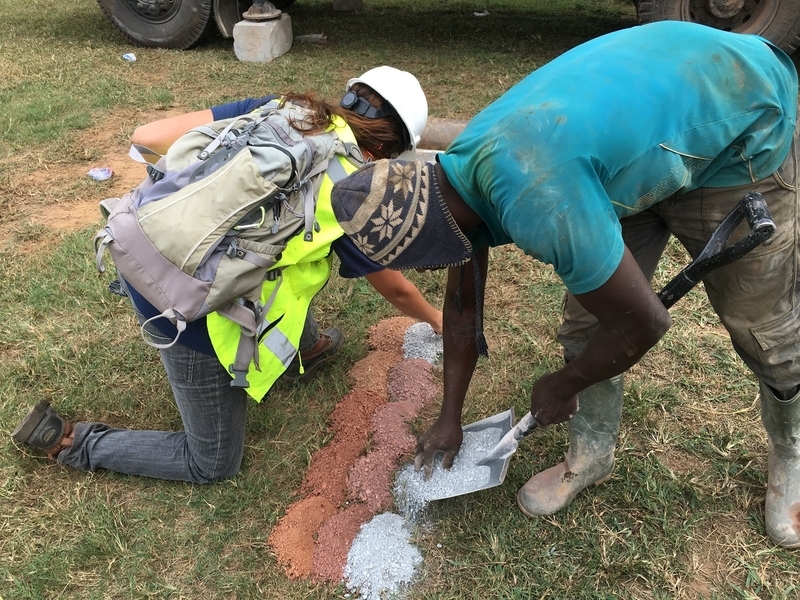 The team explored the option of drilling additional boreholes in the north and scouted out locations, with valuable input from the community leaders and a local hydrogeologist, who provided great insight into the areas with the best potential yield. They also researched rainwater harvesting techniques that had been successfully implemented in the neighboring community, Nsakye. Our team liaised with the Water and Sanitation Team at the Regional District Assembly and the Amanfrom Elders and Unit Committee in order to develop a plan to increase Water, Sanitation and Hygiene (WASH) education in the community and conducted various interviews with community members to better understand their daily water routines and the factors that influence where they collect their water. Based on the valuable information gathered during this assessment trip, our Water Team is currently performing an alternatives analysis of the various feasible options. They are working closely with our professional mentors in order to conduct an effective cost-benefit analysis of each option, and once a decision is made, they will be developing an extensive technical plan to execute it. The Hardware Team is currently researching how to remotely monitor the level of water in the wells and to engineer a mechanism that will turn the pump on and off accordingly, which would be a vast improvement on the existing system in which the pump operates on a timer. We are hoping to have a successful implementation trip this summer and are currently organizing several fundraising campaigns to finance our expenses. When we first met with the rural village of Obodan in 2004, they identified water and sanitation as their largest problems. Open defecation had contaminated the water supply, which forced children to take time away from schooling to fetch waters from distant sources of water. 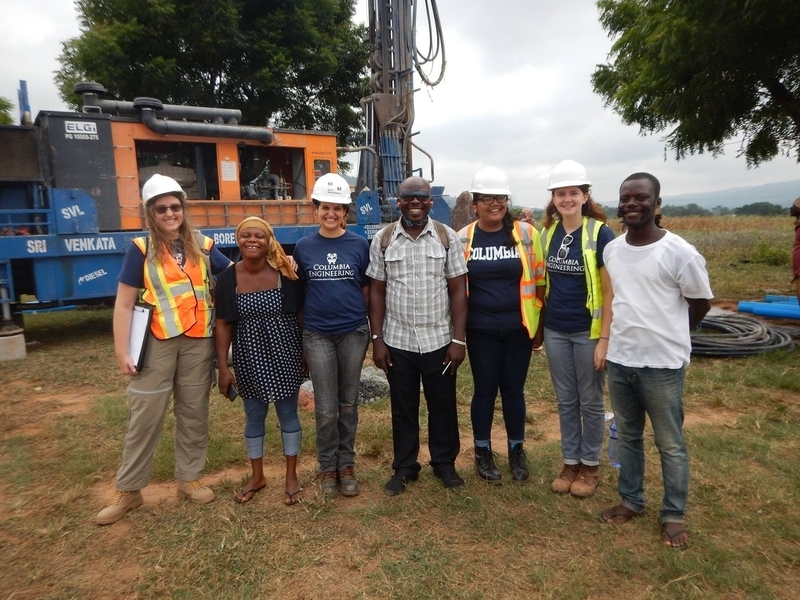 The Ghana program of Columbia’s EWB-USA chapter began working in Obodan in 2004, making it the oldest EWB program in the university. Many Columbia students have since worked closely with the village and our hard-working community contact, Samuel Gamson. The Ghana program almost immediately began work in Obodan and constructed a Kumasi Ventilated Improved Pit in the village in 2005. After repairing biogas latrines and building a rainwater harvesting system in a nearby village for a few years, the program returned to Obodan. 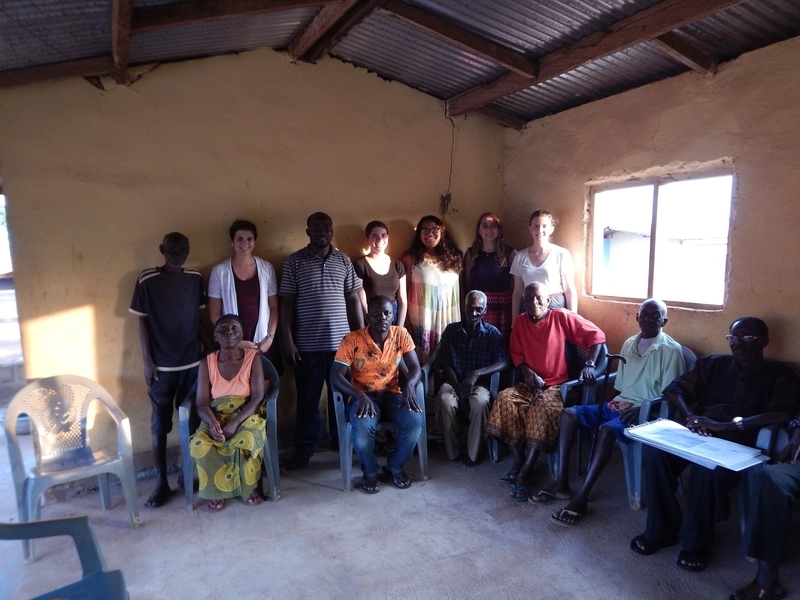 Ghana program members have overseen the successful installation of nine latrines in Obodan and surrounding villages. Once the design and construction of latrines neared completion, the water project became a major focus of the Ghana program's work beginning around 2011. Assessment teams surveyed the land for data on elevation, conducted many water quality tests around the year, met with local contractors and technicians, and helped the community determine the best way to collect money for when the system needed maintenance. 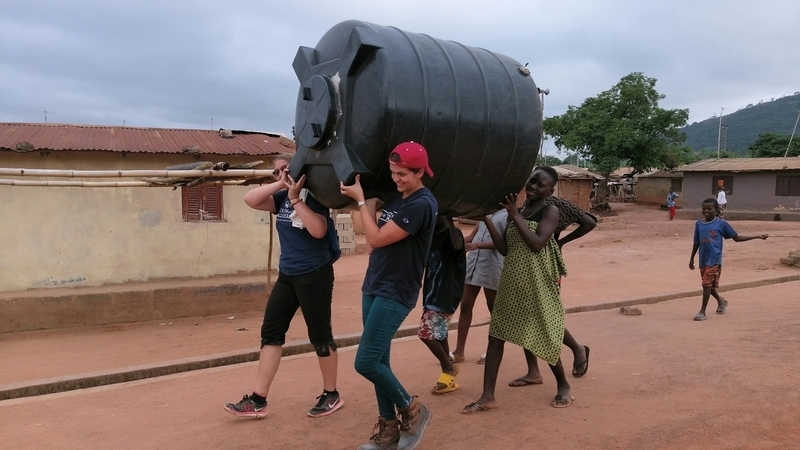 In the summer of 2013, the Ghana program constructed the water distribution system. The system consists of an electric-powered submersible pump, two 10,000 liter storage tanks placed on top of the hill in Obodan, and an extensive framework of pipes to deliver water by gravity to spigots conveniently located around the village. The water, pumped directly from the water table, avoids almost all of the contaminants that pollute surface water or shallow groundwater, and is safe to drink by Ghanaian and WHO standards. The location of the spigots eliminates the need for villagers to cross any road, and drainage ensures that any water is accidentally spilled near the spigots does not flood and contribute to erosion. As of 2016, the water distribution system is financially sustainable and functioning independently, while the latrines are community owned and operated. The money generated from collecting fees at the water spigots have generated revenue for other community projects in Obodan. We appreciate all the help we can get! Any contribution, no matter how small, goes directly to helping the people we work with in Ghana. Please consider contributing to our cause - your tax deductible donations will go a long way. We welcome your input! Please contact Udai Nagpal, our chapter webmaster, if you experience issues or have suggestions for future improvement. Press and media inquiries? Please contact Aimee Morley, our PR chair for more information. Copyright © 2014 Columbia University Engineers Without Borders. All rights reserved.